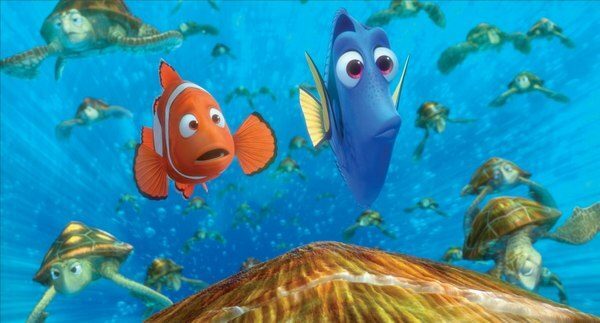 For those who were living under a rock in 2003, Finding Nemo tells the tale of a daddy clownfish named Marlin (Brooks) who, with the help of an amnesiac named Dory (DeGeneres), searches frantically for his son Nemo (Gould) who’s been fishnapped by an Australian dentist. Marlin and Dory brave sharks, whales and the deepest, darkest depths of the sea to get to Sydney before the dentist gives Nemo to his fish-killing niece. This gem of a film is the one with which Pixar asserted their supremacy over the animated world. Not content with making us empathise with toys, they did the unthinkable and made us identify with fish. The mind boggles. As with most of Pixar’s films, there’s something deeply primal about the story and be sure that anyone who isn’t moved by it, is secretly a cyborg. Marlin’s grief over losing Nemo is palpable and the film has really tragic undertones no matter how cute and colourful the protagonists are. Despite this, though, the film manages to be a pretty upbeat affair, balancing the jokes with the heartbreak and thoroughly entertaining kids and adults alike. Since this is a 3D reissue, a paragraph about that seems to be in order, however, the 3D is so subtle, that there’s barely anything to say about it. It neither makes nor breaks the film; it’s just easily ignored. Besides, the visuals are incredible anyway – even more so when you consider the fact that the film is almost a decade old. The animation is top notch, especially the ocean scenes, and so is the voice work, courtesy of a cast that includes the likes of Albert Brooks, Willem Dafoe, Allison Janney, Geoffrey Rush and most notably, Ellen DeGeneres. Her Dory is just the right blend of zany, irritating and incredibly warm-hearted and she’s a great counterpart to Marlin; the distressed worrywart. While the film came out too late to be an integral part of our childhoods, this is a chance to introduce it to this generation of kids properly, i.e. on a cinema screen. Besides, “Fish are friends, not food,” has to be one of the best lines ever committed to the silver screen and the film is worth watching just for that. Partysaurus Rex, a Toy Story short centring on Rex’s attempts to be less of a party-pooper, screens before the film. Don’t miss it.